- She didn't know whom I was talking to. - She didn't know who I was talking to. Yes. Whom is used mostly in formal writing these days. Hi Aspara Gus, I have read that , in case of objective case pronoun we use "whom" and in case of subjective case pronoun we use "who". 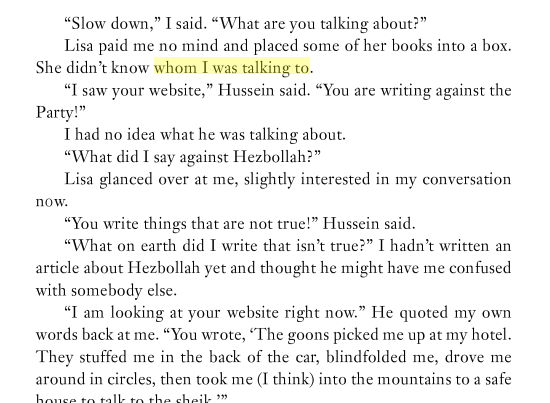 So in this sentence "She didn't know whom I was talking to"- whom is used as an object. Am I right? Sam28 So in this sentence "She didn't know whom I was talking to"- whom is used as an object. Am I right? Yes, you are right. Do note that this rule is rarely observed outside formal English, so whom is not required for grammatical correctness. Okay, I made a note of it. Thanks a lot! Thank you so much, AG. Never mind, Sam. Thanks for sticking to the topic.